I am writing to let you know about the council’s budget for the coming year. This year will be another tough year for Camden. 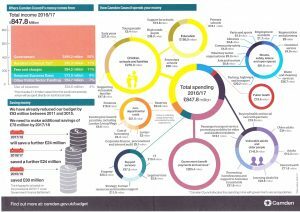 By 2018/19 our funding from government will have been cut in half, so we have had to make some difficult choices about which services to cut. To balance our budget and pay for services you value most, we have decided to increase the Camden element of your council tax by 1.99%. This will provide £1.82 million per year from April 2016 which cannot be cut by government and so will help protect services in the future. At the same time as government cuts our overall funding, services for vulnerable adults and older people face increasing pressure as our population ages. The government funding to Camden doesn’t adequately address this pressure. For this reason your council tax also includes a 2% government social care precept. This will raise £1.83 million. Government expects us to add this precept to bills and it can only be spent on services for vulnerable adults, but it does not address the full pressures we face. In addition to these changes, you may be aware that the Mayor of London also sets an element of your council tax via his budget process. This is set out in your bill. We’ve worked hard over the years to deliver value for money and keep council tax low. This is only the third time council tax in Camden has increased in a decade. The increase will cost just 80p per week for a band D property. Nonetheless we know that some residents are in very difficult circumstances, so please remember that there’s help if you are unable to pay your bill. Visit camden.gov.uk/council tax for more information. Despite these challenges, we are still determined to make a difference for our residents. We have one of the largest house building programmes in the country, the best primary schools in the country and we are investing more in community facilities than the borough has ever seen. We’re making a real difference by creating jobs, building homes and reducing child poverty. We are also lobbying government on your behalf on issues like the Housing and Planning Bill, seeking to influence and explain to Government the significant impacts on Camden. London is facing an unprecedented housing crisis and the council considers that the Bill will only make things worse in Camden. We think it will reduce the availability of genuinely affordable homes, drive up rents, reduce our ability to build new homes and threaten the future of London’s socially mixed communities. We have explained to members of the Bill’s committee that Camden and its residents will be disproportionately affected. We will continue to focus our resources on the issues and services that matter most to our residents. 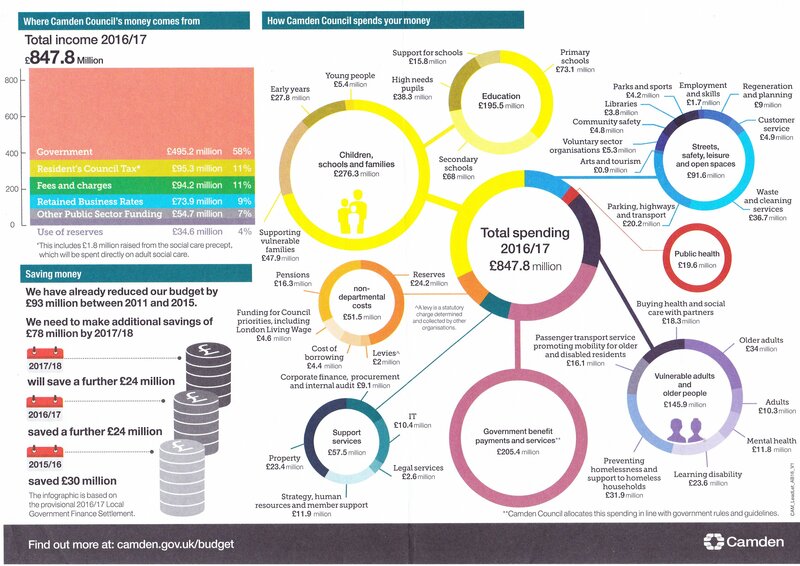 On the back of this letter there is a more detailed breakdown of where the council’s money comes from and how this is spent on providing the services that make a difference.